We start with a piece we first posted just a few weeks ago. If you missed it, check it out. If you didn’t, check it out again! Back Issue #99 is on sale now! 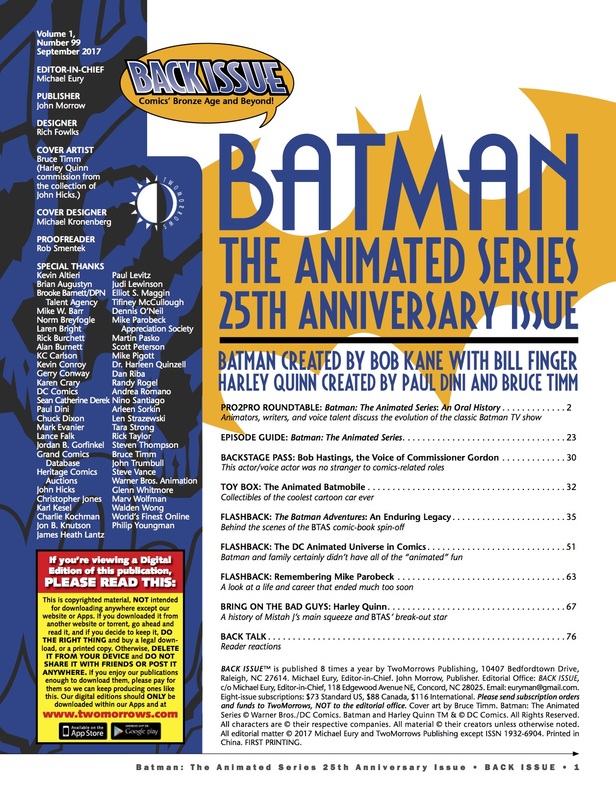 This month’s Back Issue #99 — due to ship 8/9 — is a blowout special celebrating the 25th anniversary of Batman: The Animated Series. Editor Michael Eury has turned over the entire issue to a show that completely remade the world of adventure cartoons and became, for much of a generation, the definitive take on the Dark Knight. 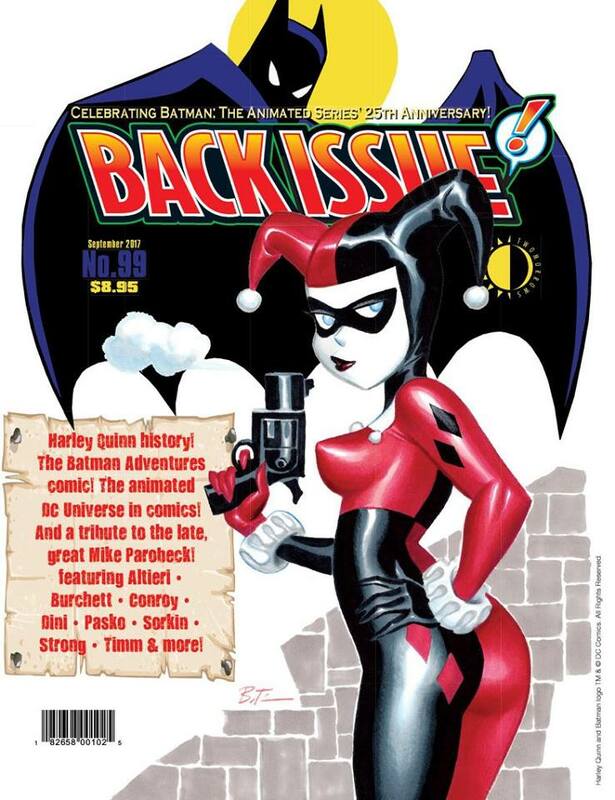 The issue’s filled with wonderful stories, info and illustrations but the backbone is an oral history produced by John Trumbull that includes major players like Bruce Timm, Kevin Conroy, Paul Dini, Andrea Romano, Kevin Altieri and many others. And here’s the issue’s Table of Contents, so you can see just how much other great material there is in Issue #99. As always, check with your local shop to reserve a copy. The mag may be due to ship this week but some places get it at different times. You can also get it directly through publisher TwoMorrows. 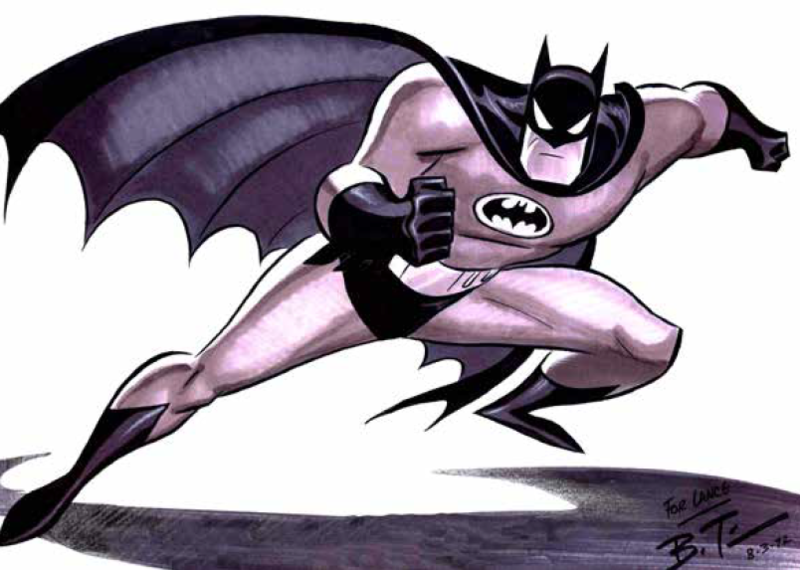 Recognizing the strength of Bruce Timm’s character designs and Eric Radomski’s backgrounds, Warner Brothers Animation president Jean MacCurdy asked the two artists, who only tangentially knew each other from Tiny Toons, to collaborate on a two-minute presentation reel for Batman. She recommended that the duo look at the 1940s Fleischer Superman cartoons for inspiration. Bruce Timm, producer, director: They’d been in negotiations with Fox Kids to actually do the show, and the negotiations, I guess, had been dragging on for a while. Jean thought that might be a good way to kind of goose the process was to just show them some footage and say, “Hey! This is how cool it would be if you guys do this,” and then, unbeknownst to us, by the time we had actually finished the thing, it was a done deal. Timm and Radomski’s efforts weren’t wasted, however — their pilot sequence soon began to circulate around the animation and comics communities. Dennis O’Neil, Batman comics writer and editor: I was sitting in my office one day and these two guys from California came in and asked if they could show me something. And they put a tape on the machine, and what was on the tape was what became the opening of the TV show, the first minute or so of animated action. And I was impressed. I am not a big fan of animation and especially not of TV animation, but it looked to me like they were solving the problems I perceived. Sean Catherine Derek, writer, story editor: Let’s face it, that show looked awesome. It was awesome! Eric painting [backgrounds] on black? That had never been done! Genius! Timm: It kind of cemented Eric and I as being the frontrunners to actually produce the show, so that was a good calling card for us. Radomski and Timm’s efforts paid off, as MacCurdy named them producers of the 65-episode first season of Batman. The offer startled Timm, who at most was expecting to become art director of the new series. Timm: That was about as far as my ambition went. It didn’t even occur to me that I could possibly be offered the chance to actually be the showrunner. That was just… y’know, mega-gravy. It was an amazing opportunity and I was wise enough to not just get totally freaked out and say, “Oh, no! I can’t handle it!” I would be crazy to turn down an opportunity like that. But at the same time, yeah, it was definitely a whole lot of responsibility dumped on us out of nowhere. Yeah, it was daunting. Absolutely. As Batman gained personnel, the look of the show developed further. Background designer Ted Blackman defined Gotham City’s “Dark Deco” look with buildings inspired by architect Hugh Ferris. Comic-book artists Mike Mignola and Kevin Nowlan contributed to the character designs for Mr. 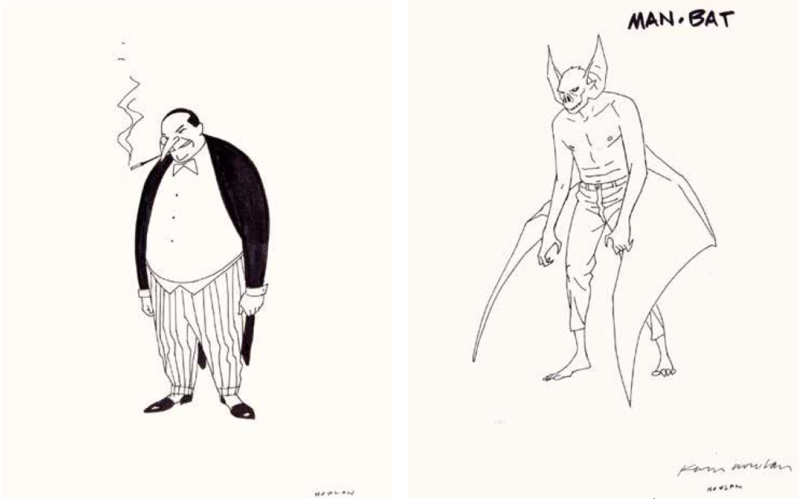 Freeze, Man-Bat, Killer Croc, and others on a freelance basis, and animator Lynne Naylor brought a Tex Avery-influence to the female characters such as Poison Ivy, reporter Summer Gleeson, and police officer Renee Montoya. Early designs by Kevin Nowlan. Timm: We wanted to get the best possible people we could and we also had to get a pretty distinct vision of what we wanted the show to be. Just because they were doing action-adventure stuff doesn’t necessarily mean they had the right point of view that we were looking for. [It] didn’t necessarily mean that they were good to go. We had to like go, like, instantly! Riba: I was expecting to be a storyboard artist on it, but [Bruce] looked at the character designs I’d been doing and went, “OK, this guy can draw, [and] I need character designers really bad.” So he put me to work on that. And a lot of the guys that he had on that at that time were like used to working in Saturday morning stuff, and they weren’t used to doing this new kind of streamlined approach that Bruce was doing. Kevin Altieri, director, storyboard artist: The real difficulty was in the layouts, because in the character layouts, you hire people with experience in layouts, and at that time, everyone was just doing goofy, funny, wacky cartoons. If people had drawn action-adventure, they hadn’t done it for a long time. Part of the reason the early shows looked so good was that we had total control over the layouts. It was totally done in-house. 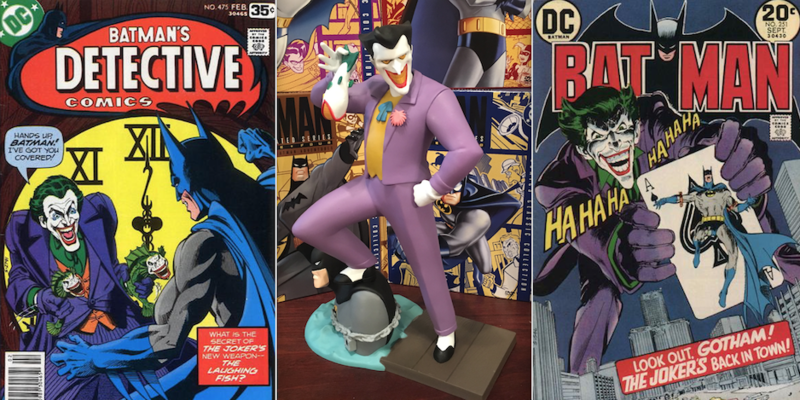 A Diamond Select Joker statue based on The Laughing Fish episode. 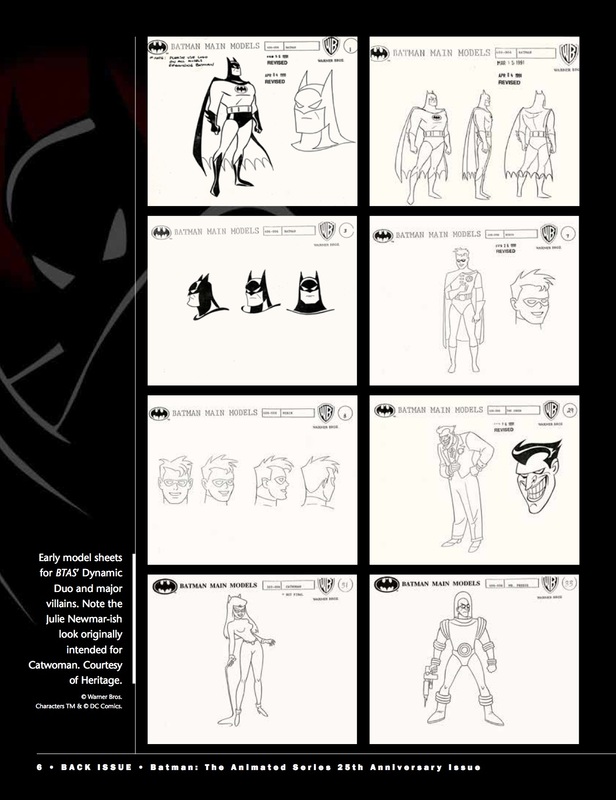 In addition, many of BTAS’ writers adapted classic comic-book stories to the show, such as Steve Englehart’s The Laughing Fish or Denny O’Neil’s The Joker’s Five-Way Revenge, which Paul Dini combined into one. Paul Dini, writer, story editor: It’s hard to adapt a comic directly for animation. The storytelling and pacing are different, and there might be other elements like excessive dialogue or graphic violence that don’t translate well from one medium to the other. In the case of the Batman stories we adapted, we took elements from the comic book that made a great story and reworked them to fit the pace and tone of our series. It was a matter of knowing what to cut and what to save, and what to rework, to best suit our own versions of the iconic characters. 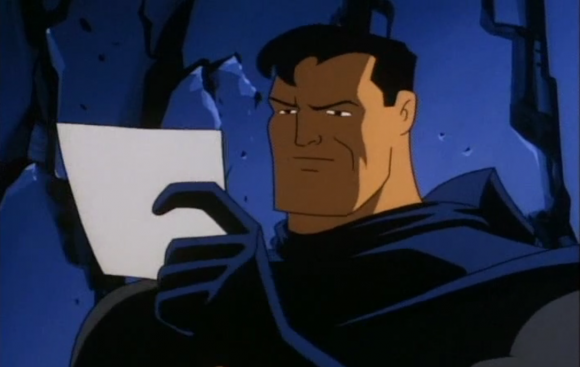 Several comic-book writers ended up writing for BTAS, often translating their own comic stories to the television medium. 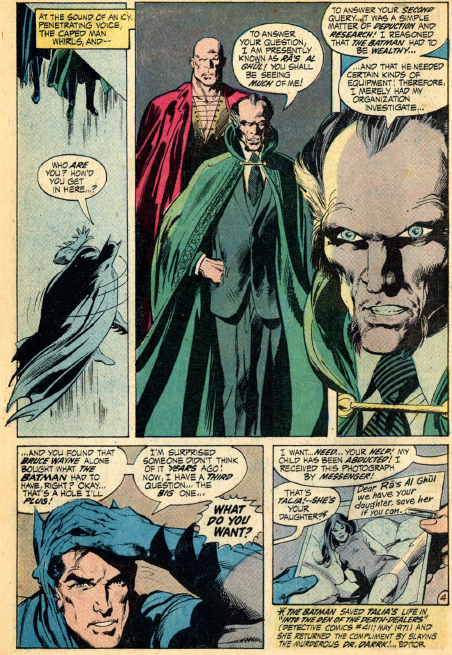 Dennis O’Neil adapted his classic Ra’s al Ghul stories into the two-parter The Demon’s Quest. O’Neil: I thought, “OK, I’ve got me a 22-page comic book and the TV show’s about 20 minutes. This is going to be a piece of cake.” And I found that if I had done my comic-book story literally, I would have run out of material before that 20-minute mark. So, trying to be a reasonably disciplined professional, my job became to invent new scenes that looked like they were part of the original. Timm: I don’t even remember how long our total casting process lasted. It was a good couple weeks, at least. The two hardest parts to cast were the Joker and Batman himself. Almost everybody else we pretty much got them nailed down pretty early on, but Batman was really tough. We probably auditioned a hundred different people. And probably nearly the same number for the Joker. Ultimately, Kevin Conroy was convinced to read for Batman/ Bruce Wayne… and Timm and Romano instantly knew that they had found their Dark Knight. Andrea Romano, voice casting and direction: Bruce and I did have one of those jaw-dropping moments. That “Eureka!” moment! Bruce and I all but leaped up from our chairs and hugged each other. We were so happy that we had found exactly what we were looking for! Bruce Timm: This guy that none of us ever heard of came walking in and nailed it the minute he opened his mouth. I was like, “Ho! OK, we’re done!” So that was serendipity. Kevin Conroy: It was totally a fluke! It was a one-in-a-million shot and I was just so lucky to have been in that booth that day and made that choice. A lot of people don’t realize how much of acting is about choices. There’s a dozen different ways to play a character. You can play the same scene and make it tragic or make it comic. It’s all about choices! And the director usually guides you in the choices he wants you to make, because he has a vision for how he wants the show to work, but when it’s a new show and new characters, they don’t really know what they’re looking for. I was just lucky that one day that I made that choice, and it led to 25 years of work. That’s amazing. Romano: It began a very long love affair among Bruce, Kevin, and myself, and the entire production crew on that project. It was just dreamy. Conroy: I think I’ve kind of fallen in love with the character over time. I really grew to love his sense of morality, his sense of dignity, his really… no gray zone between black and white, between good and evil. He’s so pure in that way. It would be so hard for any of us to achieve that in our daily lives. He’s a wonderful character to play and he’s a great character to have been associated with in any way. Back Issue #99 is available at comics shops or you can order it directly from TwoMorrows Publishing, here. Damn you, Dan. I’d let my subscription to run on Back Issue. I’ve been there from the beginning. Bought number one on. Bagged, boarded,…all that. Love the mag. The wife says we need to cut back. Save money. Frugality. Practicality. Functionality. No room for,…sentimentality. But now I’m gonna have to buy this Thanks a lot. Great! Now I’m gonna have to listen to that. Here’s my take on B:TAS. When they did the fight in the desert between Batman and Ras; I said to my wife as it progressed. If BATMAN Doesn’t Kiss Talia after Ras is taken down then the cartoon will have failed. Soon after, Batman Kissed Talia. That was proof to us that this show was Golden.